We rock at school lunch ideas for kids, and we want to help you rock at it, too! Take a look at our five tips below with the help of Tyson® and Kroger, and be ready for an amazing school year this year! This post has been sponsored by Tyson®. All thoughts and opinions are my own. My hugest, biggest tip I can share to any and all parents looking to streamline the process of making school lunches for kids easier is to cook and refrigerate your kids’ meals the night before. It’s one less thing you’ve got to worry about in the morning, you know parents? Let’s do our best to make mornings easier, and make those school lunches the night before! You don’t have to be a pro to rock at school lunch making for kids! Just know the basics! It’s all about experimenting! Tip #1: Use Hillshire Farm® Lunch Meat wrapped around cheese sticks to make “kid sushi” for school lunches. Using any variety of peel-and-eat cheese stick you can find, you take one slice of Hillshire Farm Lunch Meat and wrap it around a cheese stick, and then cut it into thirds. Stand it up inside your child’s lunch container, and tada! You can pack about 3-4 cheese sticks with slices of lunch meat in this container! It provides a perfect protein-packed addition to your child’s school lunch! Tip #2: Take the stick out of corn dogs so they fit inside the lunch containers. Pack the sticks so your kids can reinsert to eat them at lunch! When using State Fair® Corn Dogs, State Fair® Classic Corn Dogs, or State Fair® 100% Beef Corn Dogs, the sticks can make it tough to pack in certain lunch containers. By taking the sticks out after cooking, and placing them in their lunch containers, they can easily reinsert the stick to eat their corn dogs at lunch time! Tip #3: For smaller children, slice the corn dog into pieces to make “corn dog bites.” They can peel them apart to eat at lunch! State Fair suggests that children 5 and under should cut up their corn dogs before eating. By cutting almost all the way through the center of the corn dog after heating it up and then slicing it across, you can make tinier bite-sized bites for your small child to eat at lunch. You almost cut all the way through the corn dog, but leave just enough to keep it together so they can peel them apart at lunch. Tip #4: Use Tyson® Fun Nuggets or Chicken Nuggets inside their school lunch boxes, they’re easy to eat and easy to pack! Regardless if you’ve got a younger or older child, you can never go wrong with chicken nuggets! Tyson Fun Nuggets are ridiculously cute and so easy to pack for your kids for lunch! And if you have small sauce containers with lids, your kids can also pack ketchup, honey mustard, ranch, barbecue sauce, or whatever sauce they love to dip chicken nuggets into! To save yourself having to pack additional sauces, and to offer your kids more variety as far as chicken goes, you could always opt to send them to school with Tyson® Honey BBQ Chicken Strips, Tyson® Parmesan Herb Encrusted Chicken Strips (although I adooore dipping this variety in ranch myself), or Tyson® Buffalo Style Chicken Strips (if they can stand the heat). Tyson’s portfolio of products make back-to-school meal planning SUPER easy. They’re quick-serve, protein-packed and tasty meals for all your back-to-school meal planning needs! Tip #5: Reuse Hillshire Farm® tubs to also pack for school lunches – they can fit a sandwich perfectly! You get a two-in-one deal when you purchase Hillshire Farm Lunch Meat tubs, because they can be reused for school lunches! 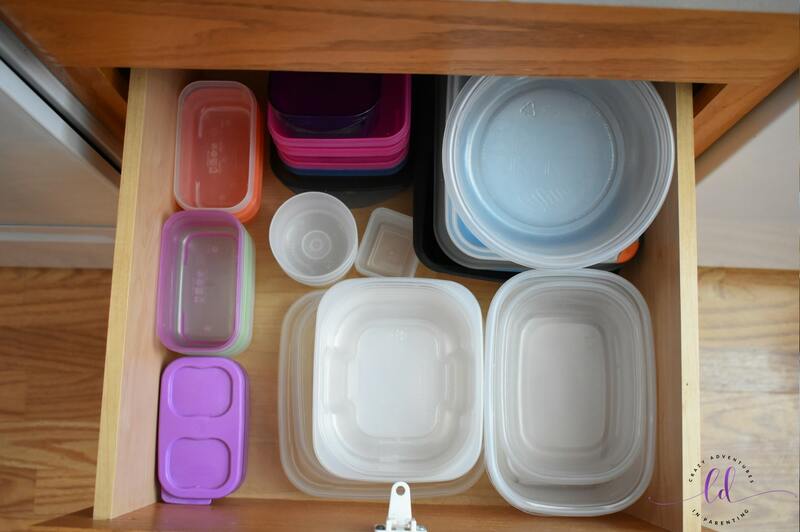 Take a look at our school lunch drawer full of containers! See how perfectly the Hillshire Farm Lunch Meat tubs fit a sandwich? Bonus tip for school lunches: Prepare in advance and stock up well! We are lucky to have room in our garage for a deep freezer, which has come in QUITE handy with our large family’s needs. We have all our basics in our fridge freezer, but back-ups and such go in here, and as you can see we are fully stocked for breakfasts, lunches, and more! I like to have a well-stocked freezer (and fridge) to give the kids lots of options for breakfasts and lunches throughout the week. For more lunchbox inspiration and digital coupon savings, check out Kroger.com! And take a peek at Tyson’s meal planning calendar to make meal planning for back-to-school lunches that much easier this year! Using our school lunch containers, along with the help of Tyson products at Kroger Family stores, packing lunch can be safe and easy for parents and kids to do together!